The Nestlé-Anglo-Swiss Condensed Milk Factory still looms large in Middlewich history, despite the fact that it closed many years ago. Now that the factory itself, which was also used as a silk mill for many years, has disappeared to be replaced by yet more housing, the only evidence that it was ever here is in the name of the former manager's house, Swiss Cottage, which stands nearby in Webb's Lane. Our picture shows the huge bulk of the factory stretching away from the Big Lock pub, which is just beyond the large building on the left, to run alongside the Trent & Mersey canal as it heads for Northwich. On the extreme left you may just about be able to make out the footbridge which still carries the public footpath from King Street, near the entrance to Harbutt's Field, to Webb's Lane. Henri Nestlé was born in 1812 in Frankfurt and made his fortune in the dairy industry both on the continent and in the UK, despite competition from his arch-rivals the Page Brothers, founders of Anglo-Swiss. 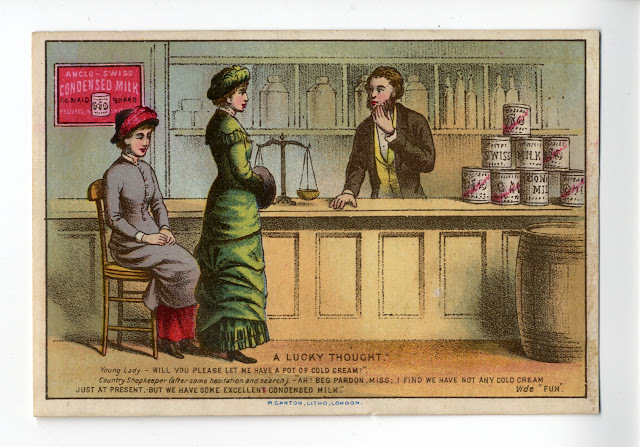 It was the merger of the two companies in 1905 which led to the establishment of the Nestlé-Anglo-Swiss company. 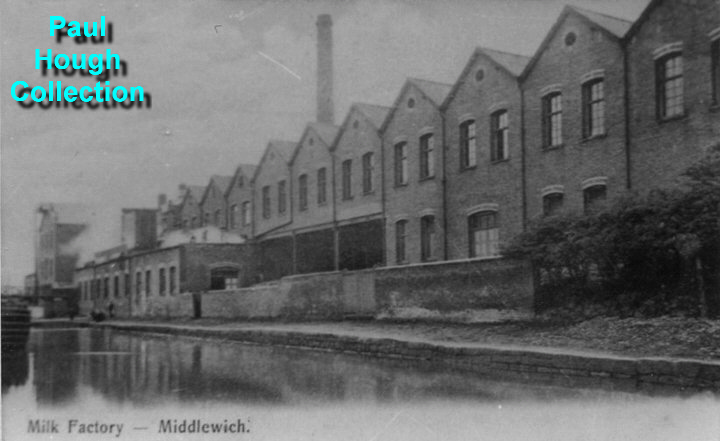 The Middlewich factory was the major factory in the group, which also had premises in other towns around the country. In fact the company's design department was based here and produced plans for the other factories in the group. When I was growing up in King Street our neightbour, Dora Darlington, used to regale us with stories of riding around the town on the back of the milk cart which delivered milk and other products in the area, eating that famous local delicacy a 'conny-onny butty' (or condensed milk sandwich, to the uninitiated). Which brings us to another peculiarity of the local dialect. Although Middlewich English uses the short form of vowels - as in 'bath' rather than 'barth' and 'conny-onny' is pronounced exactly as spelt, the longer form - i.e. 'condensed milk' (if you can have a longer form of something that's condensed) is always pronounced 'corndensed milk'. Similarly 'concrete' is always 'corncrete'. Just so you'll know if you ever walk into a local shop or builder's merchant and try to buy condensed milk or concrete. I wouldn't want you to get looked at askance. The closure of the milk factory in 1931 was a blow to the local economy, and there were sighs of relief when the premises were taken over in 1932 for use as a silk factory. It's hard to resist using the obvious phrase, so I won't: It was a case of 'from milk to silk'. 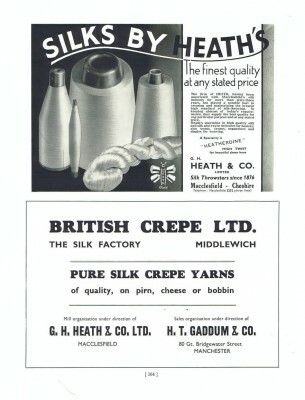 The silk mill was operated by British Crepe Ltd, a division of the Macclesfield silk makers G H Heath & Co. The massive brick built factory was reduced in size over the years following several disastrous fires, and production at Middlewich, which by then had moved over to synthetic fibres, ended up being carried out in modern industrial units before final closure at Middlewich in 2003. Production was then moved to Manor Lane in Holmes Chapel and the company ceased production there in around 2005-6. Many thanks to Gina Nicholson (see Facebook feedback, below). Geraldine Williams: It never occurred to me why Swiss Cottage was so named. Doh! Gina Nicholson: British Crepe closed for good in Holmes Chapel about six years ago (2005-6? -Ed). My Dad, Alan Dean, worked there for 40 years until it closed. It did move to Holmes Chapel around 2003.